Here is some good news from the legal arena and one more reason why (if you are a dentist reading this post) you should be a member of organized dentistry. In August of 2013 several California dentists filed a lawsuit against Delta Dental. The letter, which is posted below, explains most of it. I thought it was important to post it here so that both dentists and non-dentists alike can see what Delta has done and will continue to try to do moving forward. I am writing you today to inform you about the latest developments in the case against Delta Dental. A recent decision by arbitrators will allow the arbitration to proceed despite a motion by Delta to dismiss it. The legal action was filed in August 2013 by CDA and several individual dentists challenging, in part, Delta’s attempt to change Premier provider agreements. Prior to the filing, CDA learned informally of a planned rate reduction of 8 to 12 percent. A panel of three arbitrators found that there is sufficient evidence to allow the individual dentists to proceed with claims that Delta’s attempt to change key provisions of its participating dentist agreements violated the legal doctrine of “good faith and fair dealing.” Previously, arbitrators ruled that CDA cannot be a party in the arbitration because the contracts are between individual dentists and Delta. In response, CDA has filed a separate legal action in San Francisco Superior Court to ensure that we can continue to protect members in this matter. We expect an arbitration hearing to occur toward the end of the year or early in 2015. With regard to CDA’s action in Superior Court, Delta will have to answer by the end of August. We have known from the beginning that taking legal action against Delta would be arduous at best, but we knew it was the right thing to do. And although this recent decision is an important one, it is mainly procedural and not necessarily an indication of whether the arbitrators will ultimately agree with the arguments. We believe that, at a minimum, Delta must be transparent in its processes, submit comprehensive data to justify any actions or changes in its plans and provide reasonable notice so dentists have adequate time to make any necessary changes in their practices. If you have challenges today that cannot wait until this issue is resolved, be assured that CDA is here to support members with sophisticated practice management and dental benefit guidance through CDA’s Practice Support at 800.232.7645 or cda.org/practicesupport. Thank you for being a member of the California Dental Association. Your membership provides us with the opportunity to support our members in this legal action against Delta. We will continue to provide you with new information in newsletters, the CDA Update and on cda.org. Toronto – July 29, 2014 – More and more Canadian dentists are now using the social media to promote their dental practices, according to results from the DIAC (Dental Industry Association of Canada) Eighteenth Annual Future of Dentistry Survey. Over 25% of respondents are currently actively employing social media as a promotional tool, an all- time high and progressively trending upward from 16.4% last year and 13.3% in 2012 when the question was first asked. This has moved the option from last place to number 4 on the list of preferred promotional options, after the traditional referrals (#1), promotion of new technologies (#2) and community service (#3) and well ahead of print/TV/Radio media, newsletters (whether print or on-line) and direct mail. A further 40% stated they were planning to use social media within the next two years. While this percentage of those “planning to use Social Media” is a similar result to that from the past two surveys, it is apparent that Canadian dentists who stated they were planning to employ Social Media as part of their practice promotion efforts are actually implementing it over time. Almost 1000 (987) practicing Canadian dentists responded to this year’s survey (similar to the response achieved over each of the previous seventeen years) with a good proportional distribution across all regions of the country. Based on this response rate, overall 2012 survey results have an accuracy of +/- 3.1% 19 times out of 20. I was rooting around on Amazon recently and I came across their new 3D printing store. I was unaware of the new site, but was impressed to see that you can actually upload your own designs and have them printed and sent to you via the usual Amazon delivery channels. I'm not too familiar with the whole design process involved with 3D printing, but I've seen some of the printers available, and they are incredible. Now you have the option, instead of buying a 3D printer, you can simply upload your own design and print away! Now fluent in how to do the 3D modeling & rendering yourself? No problem, Amazon has lots of designs for you to choose from. Interested? I thought you'd be. Take a look at the site and see what it's all about. Welcome to the 3D printing Store at Amazon.com. From futuristic fashion accessories to home decor, this is your source for the gear you need to shop the future. We've all had the inevitable *autocorrect fail* moments in our lives. Sometimes they are from our actual computers, but most likely they are from some type of one of our mobile devices. In an effort to make our lives easier (and since tons of individuals never actually *learned* to type) the smart people behind the tech tried to make using said tech as easy and seamless as possible. Hence hilarity ensues. I once texted a friend that I had been planting some seeds (the little objects that plants grow from) in the backyard only to glance at the screen and notice that I told him I was planting Seabees (a part of the US Navy that consists of combat engineers that build bridges, etc). Then began the inevitable jokes about me being some type of serial killer. Once after a staff meeting where we played games and just de-stressed for once instead of actually having a working meeting, Dental Assistant Terri posted to her Facebook page (intentionally and full well knowing she was making up a word) "We just had the *funnest* staff meeting ever!!!" Moments later she was explaining to me that she had NOT posted "We just had the *dumbest* staff meeting ever!!!" So… where did this all start? Where did it all come from? I happened to be doing some reading and research on another topic for DPR and stumbled across a great read on the subject from Wired magazine. I can't say enough good things about Wired. I've been a subscriber for years and I still read every issue pretty much cover to cover. The article was written by Gideon Lewis-Kraus and is a tremendously good read. I really think you owe it to yourself to set aside a few minutes, perhaps today over lunch or perhaps right now and give it a look. The humor of autocorrect as well as the overall history of the project is really fascinating, especially to a die hard geek like me. If you're reading this, chances are you're a die hard too. Give Gideon's article a read. You'll be glad you did. According to the evaluation report, “In CR/CRA’s 37-year history of controlled clinical trials now involving over 100 different brands of resin-based composites, the nanofill resin brands tested showed best performance yet recorded at three years of service1.“ The report also indicated that Venus Diamond and another brand were best able to overcome clinical problems and patient habits. Venus Diamond embodies a true balance of science and esthetics based on a patented cross- linked polymer matrix. The optimal physical properties of Venus Diamond offer a composite that truly performs in every category with low shrinkage stress, unique handling, exceptional strength and durability, and perfect color adaptation. With over five years of extensive composite research that resulted in a patented chemistry, Venus Diamond is the ideal choice for both direct and indirect restorations. For dentists looking for a composite with a creamier consistency for use with anterior restorations, Heraeus Kulzer offers an outstanding companion product. Venus® Pearl is a universal nano-hybrid composite based on the innovative urethane monomer chemistry of Venus Diamond and offering the same unprecedented combination of low shrinkage stress and high durability. Formulated for easy handling, Venus Pearl delivers exceptional esthetic results through excellent color adaptation, sculptability, and polishability. On Friday I got a chance to tour a serious top tier data center... And WOW was it impressive. I was in Charlotte and the tour was courtesy of Aspida. I saw security of data that would rival anything seen in movies & actually better. If you are looking to secure your email, check out Asipda. You'll be glad you did! Last week as we were leaving the office on Thursday evening, one of the staff pointed up at the tower on the office and said, "Hey something's loose up there!" Sure enough, there sure was something amiss. If you look to the left at the bottom of the tower roof, you'll see it. Anyway, what to do? It's 5:15 pm on a Thursday. It's not like you just get someone right out to fix it… or can you. I took the above photo with my iPhone and sent it to my buddy Tom Baugh who owns KC Constructors. His firm built the office for me 6.5 years ago and anytime something needs fixing, I call him. So I took the photo and texted it to Tom. Within 2 hours I got a response back that he was on it. On Friday morning, the guys from KC Constructors arrived and quickly had the problem completely fixed. That's the reason I deal with these guys. How many companies could you contact after hours on Thursday and have a repair crew there the next day? Not many I bet. I've always gotten a kick out of Weird Al. I"m not sure why, but I think it's got to do with the certain aspect of his attitude. As someone who is a journalist, i may not be perfect, but I really strive to try to use proper english. Daily I cringe when I hear people throw words, phrases, and contractions about that don't even make sense. "My friend, which is a teacher" just about sends me over the moon. So I had a pretty good chuckle listening to the latest Weird Al tune, set to Robin Thicke's "Blurred Lines" which the weird one calls "Word Crimes". Every once in a while I just am overcome with "tech love" of some type of military project or hardware. I confess. I can't help myself. Sometimes these things are just too amazing to believe and yet… there they are. So, today's post deals with a project that has been developed through DARPA. As anyone who has done some target shooting knows, accurately hitting a target is not nearly as easy as one thinks it might be. Heck, sometimes just getting close to what you are trying to hit is hard. When you add to that all the other things that deal with a target over a really great distance, it's daunting. Well now, there is the "Extreme Accuracy Tasked Ordinance (EXACTO). It's basically a guided missile, only it's a bullet. By that I mean that this bullet actually has the ability to change its path in flight. The photo above shows the red where the sight was actually placed and the projected path of the bullet, but the target is the green dot and the green line is the path the bullet actually took to get there. Pretty cool and pretty amazing. If you want to know more, take a look at the DARPA website. They even have a video of the trajectory. It seems the Centers for Disease Control and Prevention has had some epic mishaps lately. The CDC is responsible investigating and helping to prevent massive infections of scary diseases such as Anthrax, Avian Flu, and other nasty pathogens. So… of course one would think if that is your main task, you'd be "on it" when it came to containing these pretty nasty bugs right? As it turns out, no so much. Nothing makes me chuckle quite so much as the words "I'm from the government and I'm here to help and make things better". Needless to say, this is another classic example of that being exactly the opposite of what has happened. DEXIS® digital X-ray system, now in place at the Noor Foundation Dental Clinic, is helping to meet the growing needs of the uninsured in San Luis Obispo. Hatfield, PA (July 11, 2014) DEXIS has donated a DEXIS Platinum intra-oral digital sensor, DEXIS Imaging Suite and related image management software to the Noor Foundation’s Dental Clinic, a volunteer-based, non-profit organization that provides free dental services for those in its community who might otherwise go without care. DEXIS is an industry leader in developing high quality digital imaging solutions for the dental community. Since its introduction to the United States in 1997, DEXIS has become the most highly awarded intra-oral digital X-ray system with numerous awards from dental researchers and well-respected dental publications. The company has a strong history of supporting national and international outreach programs including Give Kids A Smile®, TeamSmile® and Mission of Mercy®. For more information about DEXIS, visit www.dexis.com. DEXIS is a member of the KaVo Kerr Group. KaVo Kerr Group is a global portfolio of leading dental brands that share common values of Trust, Experience, Choices, Quality and Smart Innovation. Brands include KaVo, Kerr, Kerr Total Care, Pentron, Axis|Sybron Endo, Orascoptic, Pelton & Crane, Marus, Gendex, DEXIS, Instrumentarium, SOREDEX, i-CAT, NOMAD, Implant Direct and Ormco. With over 500 years of combined experience and proven solutions, KaVo Kerr Group uniquely serves 99% if all dental practices. Visit www.kavokerrgroup.com for more information. The SLO Noor Foundation was established in December of 2009 as a 501(c)3 to aid this problem by providing free, high quality acute, non-emergent health care to those who could not otherwise afford to access care in San Luis Obispo County. It is the mission of the SLO Noor Foundation to provide the underserved and disadvantaged of SLO County with the free access to quality acute, non-emergent, care they deserve regardless of race, ethnicity, religion, immigration or socioeconomic status. Learn more at www.slonoorfoundation.org. In the very near future, we will be starting an evaluation of the Bien Air iChiropro system. 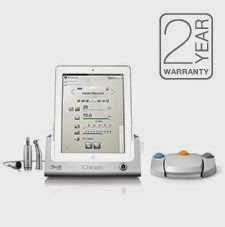 It is an implant hand piece system that is powered by an iPad. The app that the iPad uses contains all the data for most major implant systems. It also has the ability to hold patient data including demographics as well as all data that the hand piece uses during a case. Toshiba FlashAir II Let's You Create a Wireless Access Point - From Your Camera! The picture above is of an SD Card. 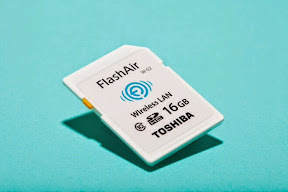 Mind you, it's not just *any* SD Card, it is the Toshiba FlashAir. This SD Card has a built-in wireless transmitter that let's you use your camera as a wireless access point. What that means is that when you take a picture, other devices in range (like your phone) can access the card and, therefore, download the photos you have taaken. Pretty cool huh? Something like this would be great for social situations like parties or family get togethers. This past weekend, I was at a family wedding and it would have been uber sweet to be able to grab photos right off the photographer's camera as he was taking wedding pics. Drawbacks? You have to disconnect from any other WiFi network before you can get the photos. Since the FlashAir only sets up a VPN, it doesn't provide you with an Internet connection. If you want to connect to the net, you have to *disconnect* from FlashAir then reconnect to get photos. There may also be some confusion between this card & Eye-fi. The latter is a SD Card that accesses your local Wifi network to upload photos to a computer on the network, Flickr, etc. However, you can't access Eye-fi with any other devices. Google Fiber is Coming to Overland Park, Kansas!!! Speed, speed, and more speed. I can remember (gasp) the days of dialup. You know, listening to the handshake of the modem and the other modem shaking back. And then, with any luck, an actual connection. That was in the days of 14.4 baud rates. Then I can think of 28 kbps which evolved into 56 kbps speeds. Then, the other other shoe dropped (and I have NO idea where that expression came from!). One day I have a modem and the next day I look out the window of my newly built house and I see these 2 guys feeding coaxial cable into the ground with some type of industrial device that puts coaxial cable under the freshly placed sod. I ran out to greet them and "welcome them to my neighborhood." When I asked them how long it would be until I got my cable high speed Internet, they looked at me like I had 7 heads or something. At least 3 months I was told. That sounded like 7 years, but I began the countdown. Of course, let's fast forward to today. I'm living in a world of 50mb/second and that seems slow to me. Thus I was turning cartwheels a couple of years ago when Google announced that their new product, Google Fiber was coming to Kansas City, Kansas. Since the beginning of Google Fiber installation here in the KC area, we've seen more and more people that are understanding just how great high speed Internet really is. Now, at long last, my city of Overland Park here in the metro Kansas City area has announced that they are allowing Google Fiber to be placed within our city. It's been a long time coming with lots of legal ranging which has taken place somewhere. I don't know what has happened, but I'm finally getting area wide high speed Broadband. The whole idea is to bring Google to the home and let the power of their high speed system run everything for you.. I'm curious to see how that works out. Interested? To see if you can get it yet, take a look at the site here. More info on the project in my part of the world is here. Anyway, I've been on the road most of the day traveling back for a big family wedding *and* a big family 4th of July celebration. I mean, what could be better than mixing a wedding with explosives? Anyway, when I arrived back the The Land of Oz this evening, I know that I would have to crank out an article for the August issue of Dental Products Report and *then* I'd have to come up with a post for the blog. So… after some serious writing (the August Technology Evangelist column is going to have some serious bonding info) I began to do some research on the blog post. It turns out that my friends at Wired have some pretty cool stuff on fireworks and the science behind sparklers and other pyrotechnic devcies. As a certified (or certifiable) "why guy" I was in Heaven as I read the article by Rhett Allain that was posted on July 4th. Head on over to Wired and give this fine piece of research some serious reading time. You'll be glad you did. Heck, I'm glad that *I* did!!! As regular readers of the blog know, I'm passionate about early detection of and the fighting of oral and pharyngeal cancers. I recently blogged about the too early demise of Baseball Hall of Famer Tony Gwynn and unfortunately that is an all too common occurrence. Oral and pharyngeal cancers are a terrible disease and we in healthcare need to work harder to bring a focus to the subject. In the United States, the country with the supposedly *best* healthcare in the world, one person dies of oral/pharyngeal cancer every hour of every day. That is a sobering statistic that we need to work harder to bring to the world's attention. Add to that stat the fact that those who DO survive are frequently disfigured by the surgical procedures required to excise the cancers and you have a disease that is terrible and only has a 60% five year survival rate. What that means is that for those who are unfortunate enough to develop this disease, in five years 40% of those people will be dead. These stats and others on this terrible disease can be found at the National Institute of Dental and Craniofacial Research. If you would like to learn what it's like from a survivor's perspective, my good friend and colleague Michael Quirk has a report over at the Dental Products Report website. However, it's not all bad. Recently, the CEO of JPMorgan Chase, Jamie Dimon, announced to the world that he has a form of throat cancer (which is a form of oral/pharyngeal cancer). Today, the folks at USA Today released a story that treatments for cancers like the one Dimon has are improving. Liz Szabo of USA Today has a very good article that is written for the lay person and is definitely recommended by this dental professional. Head on over to USA Today and give it a read.